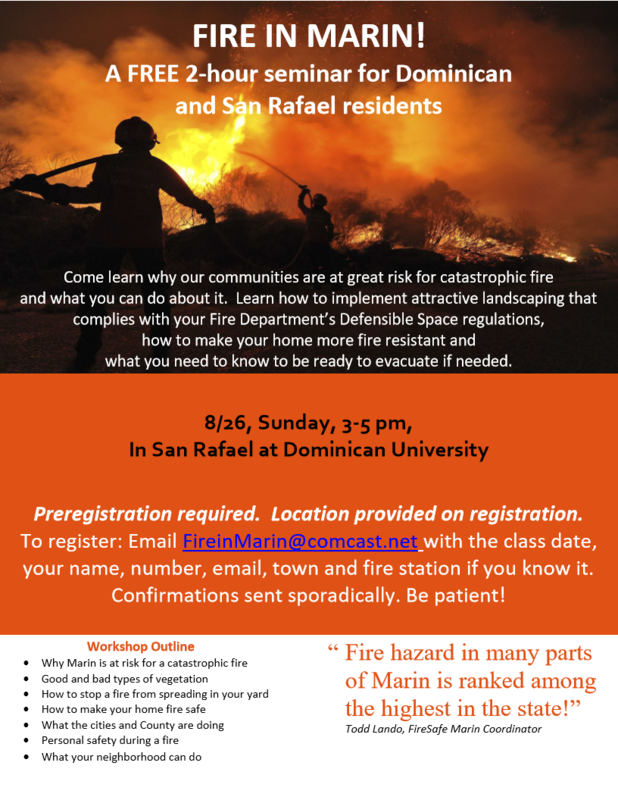 This “Fire in Marin” seminar at Angelico Hall (Edited), DUC, presented by Katherine Randolph, is the most comprehensive and detailed seminar given to teach the defense of home and life in the face of a wildfire. 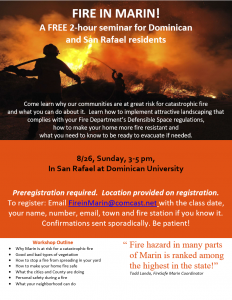 Your SR Fire Department, the Dominican Black Canyon Neighborhood Association, and the Dominican University emphatically encourage you to attend to learn how to save your home and your life. Registration is particularly important because the current list of phone numbers available to Marin County does not include numbers for cell phones or phone services bundled with internet such as Comcast and AT&T. Only 466 addresses in our Dominican Black Canyon neighborhood have registered with Alert Marin. This is just half of the 904 homes in our neighborhood. All our homes should be registered – no one should be left behind in an evacuation. So please sign up now. In cooperation with the San Rafael Police Department, we are planning an evacuation drill for later this summer. We will use Alert Marin to encourage participation. If you don’t want to test your device or receive a notice of this drill, Alert Marin allows a user to opt out of anything that is not a real emergency. Fire Season is upon us! Is your property defensible in case of a wildfire? Step 2: Ask for a Residential Fire Hazard Assessment. 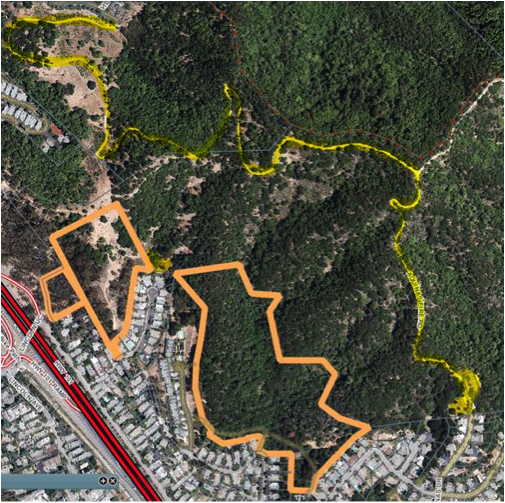 Please go to https://www.cityofsanrafael.org/vegetation-management/and fill out the Residential Fire Hazard Assessment Request Form and an inspector will contact you to schedule an appointment. Important SRFD mail arrived this last week! Please be sure to read it carefully. Your Neighborhood Association wishes to call your attention to the mailer you received from the San Rafael Fire Department this last week. This critical-information mailer describes the vegetation management needed of each of us to prevent a wildfire from consuming our homes. Please open it and learn how to follow SR property maintenance regulations that will protect you and your neighbors from the threat of wildfire. A detailed and very clear diagram shows how to create defensible space around your home – thereby increasing the chance that your home will survive a wildfire. In addition, you’ll want the helpful phone numbers listed as well as links to useful websites. So – please check that mail pile and make time to carefully study this essential information. Following up on our Wildfire Defense Forum on May 5th, your Neighborhood Assn. will send you added (maybe repetitive, but that’s ok!) facts—just the facts–periodically. For openers, you have asked about “walk-throughs” (not in your home but outside) by specialists from the SRFD who will show you ways to “harden” your home against the embers of a wildfire. Both Fire Inspector Pat Bignardi and Fire Inspector Marshall Nau of the SR Fire Dept. are the Vegetation Management Coordinators tasked with protecting the City’s residents and open space from wildfire threats by regularly conducting hazard assessments and inspections for and with property owners. They bring the latest ideas and perspectives based on what has been learned from the Sonoma fires. With about 950 homes in the Dominican area, we suggest you call them now and not wait for the wildfire season to be in full force. Where possible, you may wish to ask your adjacent neighbors if they would like to be included in the walk-through of property at the same time as you, particularly if your homes are close together.